Inventory management is a crucial element of running an ecommerce business, but it can be one of the most difficult and technical parts of the job to learn. The simple process of keeping track of goods purchased and sold is complicated by costs, overhead, rate of sale or turnover, cost of purchase, and other details that can be difficult to manage as your online sales grow. However, you need accurate inventory management to maintain the profitability of your store, as inventory carrying costs can represent as much as 25% of your inventory value. In addition, poor management, which results in out of stock events and overstocking, can be costly. Overstocking means you could get stuck paying for storage and management for items you might never sell, while selling out loses customers, can slow shipping time, and reduce customer satisfaction. This is especially relevant for Amazon sellers, whose listings and Amazon SEO will plummet if a product is out of stock. Maintaining an accurate inventory count allows you to manage reorders, keep just enough inventory in stock to meet demand, and reduce costs by understanding your sales and losses. While there are numerous elements of your inventory that will require care, you can start by ensuring that your physical inventory counts are accurate, so that the rest of your data is correct as well. The first step to accurate inventory counts is simply organizing your inventory. While very small ecommerce stores often skip this step, it becomes more and more crucial as your inventory grows. Organization allows you to understand what you have, how you are keeping track of it, and gain a better understanding of your data once you perform a count. The first element of organizing your inventory should almost always be physical organization. This will enable you to track where items are in your warehouse and handle counts more quickly. Great organization necessitates a quality inventory control system comprised of detailed labelling and naming. Using physical labels gives you the opportunity to improve the accuracy of your inventory count using technology like barcode scanners. Even if you manufacture all your products yourself, you should have a physical labelling system that matches your digital inventory count. You need quality, organized inventory names to track and manage your inventory and stock levels. In most cases, this means using or creating SKU numbers to track your internal inventory while adopting and using other technology for efficiency and retail sale. You also need actual product names, which should be descriptive based on product type, size, color, etc. Many of us are tempted to create product names that are semantic, but good inventory management means creating titles that are searchable. By creating a non-semantic naming system, you can categorize the most important part of the product first. It also makes performing inventory counts easier, because you can more easily see what a product is. A SKU is the smallest saleable unit of any inventory (for example a pack of paper cups or a vacuum) and allows you to track internal goods and quantities. If you don’t have your own SKUs, create them today and start using them for inventory tracking. A good SKU is descriptive of the product, between 4 and 14 characters long, does not contain special symbols, and is unique. This type of system allows you to neatly organize everything in your system in alphanumeric order. This improves the accuracy of your counts by ensuring that you can clearly see what each item is, and what variation. On the other hand, if you were to start an SKU off like 0001ABC you would have no way to find the SKU with a sort function, and you can’t tell what it is at a glance. SKUs allow you to update the number of physical units you have available for sale, and organize everything into your own system that makes sense for your company. They also make it easy to handle physical organization using either alphabetical or numerical organization. For example, if you use a system that values each SKU based on when it was added to your system (First: 0001, Last, 12987, you can easily structure and organize your entire warehouse. If your warehouse is large enough, and you manage all your inventory from a single location, you can also add location to your SKUs. However, this is not recommended if you use Amazon FBA, a third-party logistics company, or another type of external fulfilment. 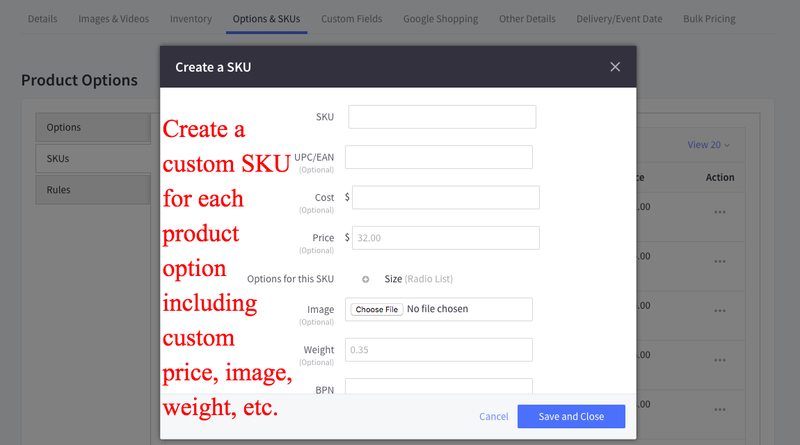 For those wanting to create custom SKUs on a per product basis, you have a few options. 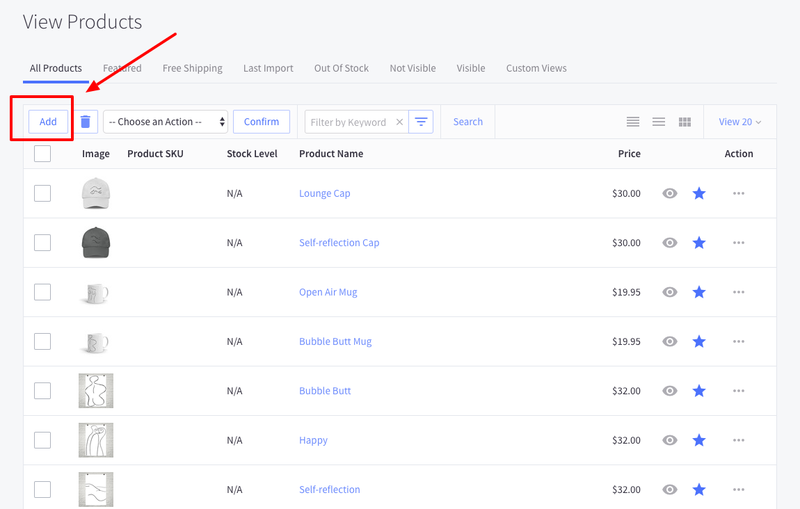 Each product within BigCommerce can have more than 500 variants or options. This means 500 various SKUs for a single product type. Of course, you can also have a single product with no options, as well. Here is how you set that up. Now, where you add in your SKU will depend on if you have a single variant or option for your product, or multiple. 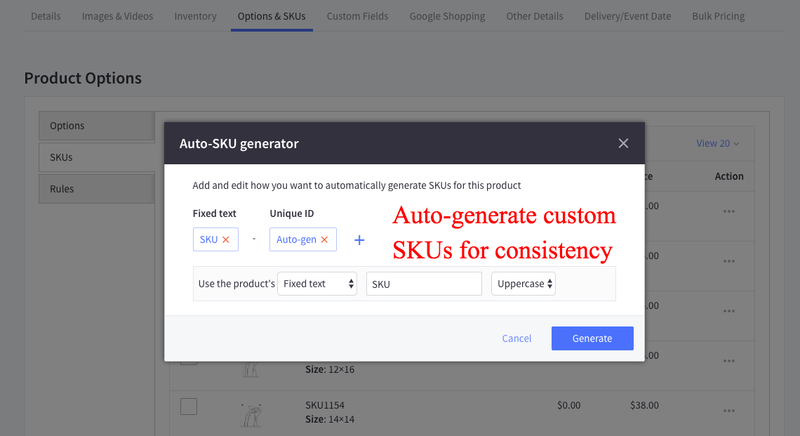 If you have multiple options or variants for each product, you have two options in adding SKUs. You can add units of measure into your SKUs or product labelling system to track how much of any given item you have, making it easy to perform counts. By ensuring that you have approved units of measure, you can create a system that allows you to track SKU volume using a simple and efficient method. By establishing which units of measure you use and creating standardized abbreviations for them (for example; ea. instead of EA, Ea, EA(s)), you can organize your count process because you know what each quantity stands for. Any retail item needs a UPC or Universal Product Code. If you purchase mass-market products instead of manufacturing your own, they should automatically feature both a UPC and EAN Barcode. UPC and EAN are almost always used in combination with each other, and can be used to introduce technology like barcode scanning to speed up inventory counts. If you manufacture your own product, you will have to purchase UPC and EAN codes to use them. UPC is valuable because it refers to a specific unit but not necessarily the smallest unit of sale. So, a UPC can include a box of 24 individual units, allowing you to scan in a crate or a box rather than having to scan individual items. This can speed up inventory count a great deal when managing bulk purchases. If you are selling books, magazines, journals, or music, you have to use ISSN, ISBN, or ISMN (International Standard Serial Number, International Standard Book Number, and International Standard Music Number). These numbers function almost the same as UPC/EAN but are assigned by the publisher using a unique publisher code. If you sell on Amazon, you must use Amazon’s ASIN (Amazon Standard Identification Number), but you can use it in tandem with your own SKU. In most cases, the best inventory naming policy is to integrate the primary universal number (ISBN, UPC, etc.) with your own internal SKU system. Combining these systems allows you to use electronic tracking to easily scan barcodes during counts to improve accuracy, while using your own system for organization and search. This gives you maximum control over your system, while allowing for the most efficient electronic counts. Improving the accuracy of your physical inventory count means taking charge of your inventory process so that you can control when and how items are counted. The first step should be to track moving inventory, so that you know where every item in your inventory is at all times. For example, many inventory systems add inventory in transit from the manufacturer but fail to note the location of the inventory, which can cause inaccurate inventory counts. Integrating location labeling and ensuring that your inventory management system integrates with your supplier or manufacturer will solve this problem. You can also integrate barcode scanning to scan every item in and out of your warehouse to track incoming and outgoing inventory, and automatically move it to a new location. You need regular physical counts to ensure the accuracy of your digital inventory. The more secluded your warehouse and the fewer employees you have, the less necessary this becomes, but you should physically count all your stock at least once per year no matter what. Stock is often lost, broken, damaged, or misrepresented in your inventory system. A physical count will give you a better idea of what you have, so that you can update your system to match. Use item count for large items. UPC and EAN barcode scanning speeds up this process and reduces human error. Use rough calculations for items that are too small to warrant item counting. Use weight or volume measurements to calculate rough estimates of how many small items (like plastic bags or packages of small toys) you have so you can save costs. Use valuation to prioritize your top selling inventory. Track your sales so that you understand which products make you the most money, and prioritize them in your count. If you sell 100+ of one item and less than 5 of another per month, it’s more important to count the 100+ item multiple times per year. Consider completing a cycle count of top-selling stock at least once per quarter. Consider creating stock sheets and having receivers counter sign them for accuracy and auditing purposes if you have a large warehouse. Human error is one of the primary causes of inventory count issues. For this reason, a strong inventory audit process should be part of your inventory count. By auditing your count as part of the process, you can strategically check every count as part of your process. Use a control officer to begin checking inventory counts against expected numbers as soon as the count begins. If you wait until the count is over, you’ll have to do a recount to audit. Ensure that the count is performed by someone familiar with the products. If you’re counting boxes, it’s easier to count if you know what is in the box and how many. Create an organized count process. Start with top selling products, count in alphabetical order, or count based on location, but use a process to ensure that everything is counted. The auditor should inspect the inventory during the count. The auditor should observe the stock counting procedure to make sure that it is adequate. The easiest way to improve your inventory counts is to make your system easy to use. By taking steps to create better organization, reduce stock, and define areas of importance, you can make cycle counts faster and more accurate. 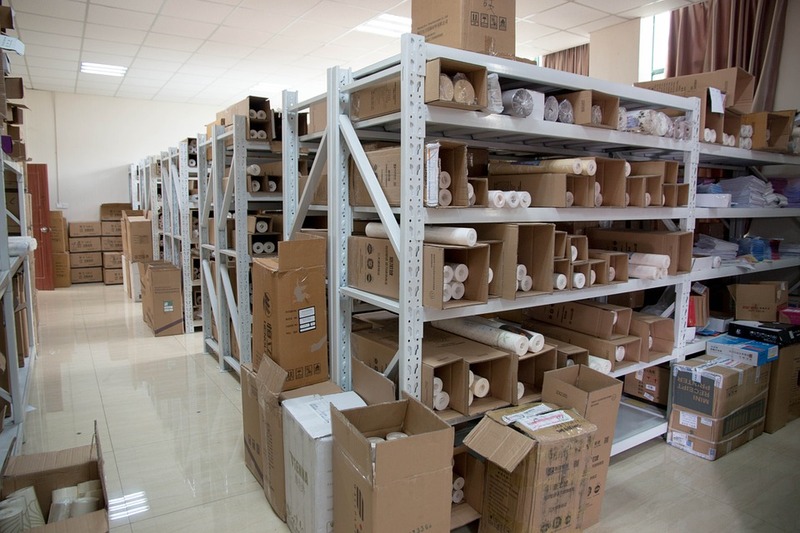 While it’s not right for every ecommerce store, stock reduction using a JIT (Just in Time) or other inventory management system can greatly reduce the volume of stock you have to count. This will improve accuracy, because you will have fewer items to count. JIT inventory management relies on understanding how much you sell and when, so that you can stock just enough to order again Just in Time to prevent a stock out. Clearly defining inventory locations as part of your system is crucial to inventory accuracy. While many leave this out of their inventory management system, a defined location allows you to easily see if the stock should be at your warehouse, in transit, with a third-party logistics company, or in manufacturing, so that you can account for it even if it isn’t in your warehouse. Automate alerts or re-orders when stock reaches certain levels to avoid overstocking. This can save you money on storage, but will also reduce the burden on cycle counts by ensuring that you never have too much of an item. While a reliable number relies on a physical count, you also have to know what your actual inventory should be. If you’re selling through multiple sales channels like Amazon and eBay plus your own site, you’ll need cross-channel inventory management to avoid mistakes. A cross-channel inventory management system will allow you to sync your inventory in real time, so that you know your sales and total inventory across all channels. Consolidating your multi-channel inventory makes physical counts easier, gives you more foresight when it comes to planning, and helps prevent problems. Creating an internal policy of organization and counting will help to ensure that you keep track of your stock over the long-term. Using EAN barcodes to scan items in and out of warehouses, ensuring that deliveries and delivery counts are verified manually, and using an auditing system to prevent loss or theft can greatly improve your internal organization. Great inventory management will reduce your costs by helping you to avoid overstocking or selling out, and enhance customer service by offering faster fulfilment. Create a brand policy of regular inventory cycle counts, develop strong internal organization, and use the right technology. Chad Rubin builds ecommerce businesses and is a top 250 Amazon Seller. Fresh out of college and Wall Street, he took his family vacuum business online and built his own direct-to-consumer e-commerce business called Crucial Vacuum. He grew it from 0 a $20 million dollar valuation in just 7 years. He co-founded Skubana with DJ Kunovac as an all-in-one ecommerce operational tool.